All rights reserved. Copyright © 1999 by Oxford University Press. Spence, Mark David. Dispossessing the Wilderness: Indian Removal and the Making of the National Parks. New York and Oxford: Oxford University Press, 1999. National parks like Yellowstone, Yosemite, and Glacier preserve some of the United State’s most cherished wilderness landscapes. While visions of pristine, uninhabited nature led to the creation of these parks, they also inspired policies of Indian removal. 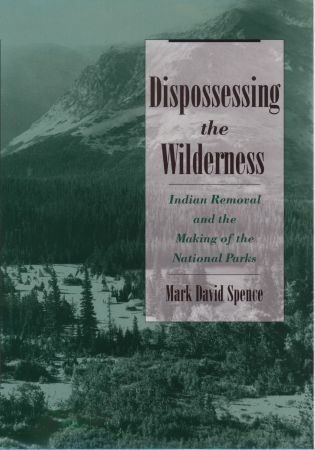 By contrasting the native histories of these places with the links between Indian policy developments and preservationist efforts, this work examines the complex origins of the national parks and the troubling consequences of the American wilderness ideal. The first study to place national park history within the context of the early reservation era, it details the ways that national parks developed into one of the most important arenas of contention between native peoples and non-Indians in the twentieth century. (Based on Oxford University Press website text).